Made of 100% High Quality (Pre-Preg) Carbon Fiber - Vacuumed Bagged, Cured using Autoclave, and Finished with a High-Gloss Clear Coat - UV Protective Coating to Prevent Bleaching (Yellowing) from the Sun - Flex Resin for Easier Installation (Epoxy Resin Binding) - 2 x 2 Twill Weave (Same Weave and Gloss Finish as the YZF-R1M Carbon Fiber Parts) - This listing is for (1) Rear Tire Cover/Hugger/Fender/Mudguard/Splash Guard Fairing. 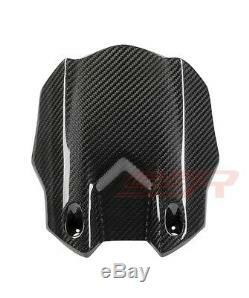 The whole process starts with Pre-Preg Carbon Fiber that is stored at Low Temperature. The Carbon Fiber is now laid into the Mold for Shaping. The Carbon Fiber Piece is now brought to the Autoclave Oven for Curing. Excess Trimming and Patterns are mostly Cut-Off by Robotics. High-Gloss Clear Coating is added to the Carbon Fiber Piece and Buffed to a Bright Shine. This specialized process results in a Stronger & Lighter Final Product. The item "2015-2017 Yamaha R1 R1M R1S Rear Hugger Splash Mudguard Fairing Twill Carbon" is in sale since Tuesday, May 8, 2018. This item is in the category "eBay Motors\Parts & Accessories\Motorcycle Parts\Body & Frame\Fenders". The seller is "ssr_mfg" and is located in San Jose, California. This item can be shipped worldwide.